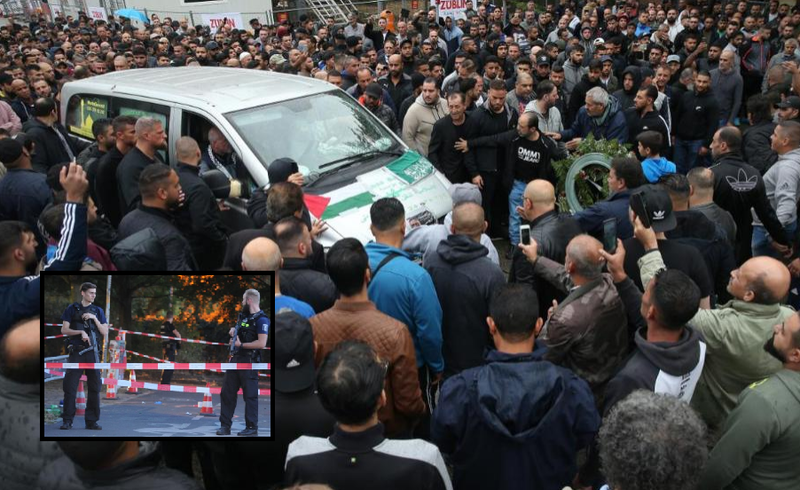 Some 2,000 people showed up at the funeral of a well-known Arab gangster (believed to originally be from Palestine) who was shot in Berlin this weekend. Draped in different Arab flags, the casket carrying the body of Mr Nidal R., the 36-year old known leader of an Arab crime gang who had more than 100 entries in his German police record ranging from theft, attempted manslaughter, violence and robberies to violations of various traffic laws was carried around a weeping crowd. There was a tense atmosphere in Berlin-Schöneberg with around 110 police officers surrounding the area. Shortly after 11 o'clock, local time police cordoned off the area as the 2,000 mourners on site were more than they had anticipated. The burial at the cemetery was also accompanied by high-ranking clan chiefs and several known members of extended crime families from all over Germany. Related coverage: <a href="https://thegoldwater.com/news/36870-Germany-Essen-Female-Police-Officer-Attacked-At-Shisha-Bar-By-Lebanon-Youngsters"> Germany - Essen Female Police Officer Attacked At ‘Shisha-Bar’ By Lebanon Youngsters</a>. Traffic chaos prevails on the surrounding streets because of the countless wrongly parked vehicles. Nidal R. was buried in the Muslim burial ground of the New Twelve Apostles Churchyard in Schöneberg. A spokesman for the police said the funeral had ended quietly and without disturbances. The known gangster was shot in broad daylight on Sunday in a Berlin park with eight shots to the body. The scene of his death was one only described in mafia movies. it would appear Mr Nidal R. walked with his family in a park in the Berlin district of Neukölln near the Tempelhofer Feld. Multiple men approached him and shot him repeatedly as he fell onto the ground in front of his children. There were screams and blood everywhere. What a nice and vibrant country Germany is these days thanks to Merkel's policies. That funeral looked like a great place to begin a "final solution" - with that many in one place….